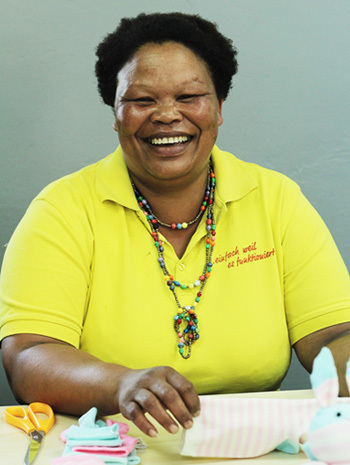 The lives of the Hope Art women change dramatically through a sense of self-worth and purpose. 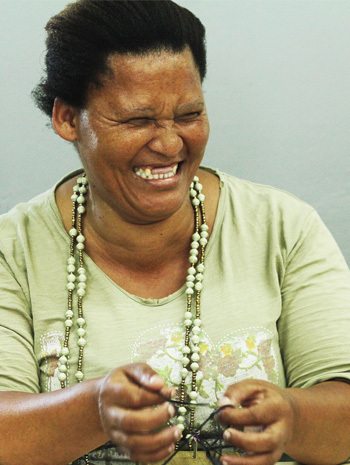 I am Chilombo Chinga, was born in 1959 and am a widow. I went through a very hard time when my twin babies were ill and passed away a couple of years ago. I grew up in an extremely poor family and was unable to attend school. It is a real privilege to now be able to send my surviving children to school with the income I earn through Hope Art, not to mention the joy of providing food for them. Thank you for caring. My name is Ireen Kawele and I was born in 1958. My husband passed away in 2005. Prior to my involvement with Hope Art I had no income and I struggled daily to support the 8 orphans left in my care by family members. It was very difficult for me when they cried for food and I wasn’t able to provide. I am so grateful that now with the money I earn through Hope Art, I am able to care for and educate these children and look after my own health. Thank you for your support. 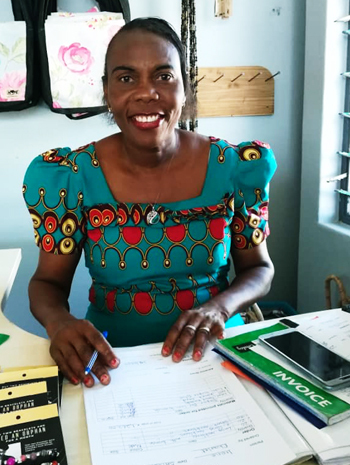 My name is Ireen Lisibani, I am 51 years old and support my 5 children, members of my family and my husband who doesn’t have work. Life was not easy before I joined Hope Art in 2012, I used to sell rice to try earn an income for my family. 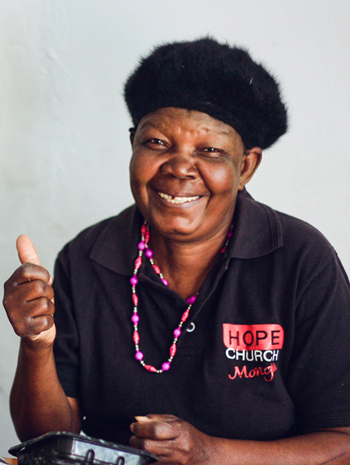 Since joining Hope I have received Jesus Christ, I am able to send my children to school and put food on the table. I am very grateful for being able to work at Hope Art. My name is Paxina Nayoto, born in 1965 and have 4 children. Before starting to work at Hope Art I tried a variety of jobs, but I still struggled to provide for my children. I now appreciate the steady income I receive through Hope Art each month. I am glad that I can use the talent God gave me and have been able to improve my sewing skills. I am lame, and it’s very difficult to find money especially if you are taking care of six orphans with many needs. I suffered a lot. Hope Art has really changed my life as you heard how I struggled at the beginning with my life and looking after orphans. Now I am okay because I am able to find food, water and also the money to use for other family needs. My name is Wendy Julies, I was born in 1985. My mom was murdered when we were young. Our grandmother took us in and raised us. I dropped out of school at 13 and decided to work. I had my daughter at 18. My daughter has always been a bright little girl. Her father fell ill and passed away when she was 5 years old. I love making bracelets. The atmosphere at Hope Art is so encouraging and I have grown closer to God. I also started serving as a volunteer at Hope Church Wilderness Heights. I am Rosemary Lubongo, born in 1968. I am the team leader of Hope Art Mongu and I enjoy learning new skills and developing my leadership abilities. Fortunately, my husband is able to provide for our family, so I have the privilege to use my earnings from Hope Art to support the many needy families and children in my community. Thank you so much for your contribution to Hope Art. Together we can make a significant impact in Western Zambia! 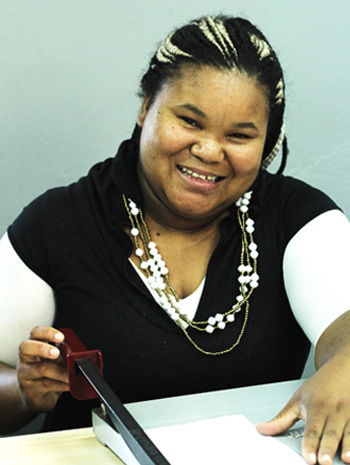 I am Brenda Plaatjies and I was born in 1994. My parents struggled with their health from when I was very young so I helped to care and provide for them when I was growing up. They both passed away by the time I was 20 years old and had just had my first son. I started going to church in 2015 and found a relationship with Jesus, changing my life and giving me a brighter future. 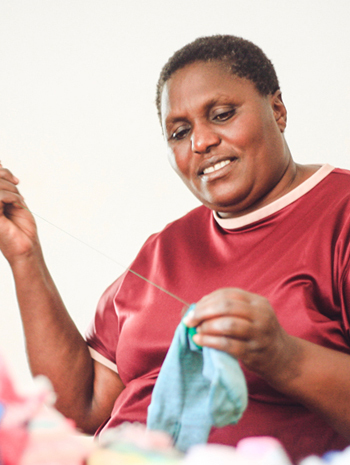 I love working with Hope Art and having such an amazing support system in these women. “I’ve always dreamt of doing work that helps people and I get to do that every day.” Felicity’s parents passed away when she was very young. Felicity’s oldest sister agreed to take them into her care. 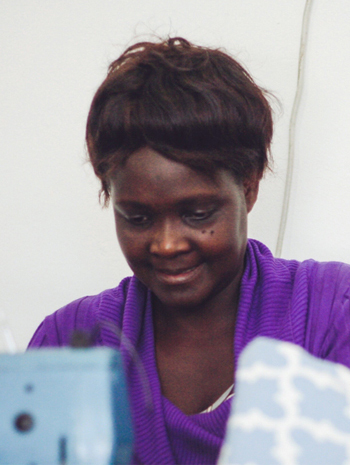 At the age of 15, Felicity fell pregnant and dropped out of school. She then ran away from home to Willowmore. There she met her husband Sarel. 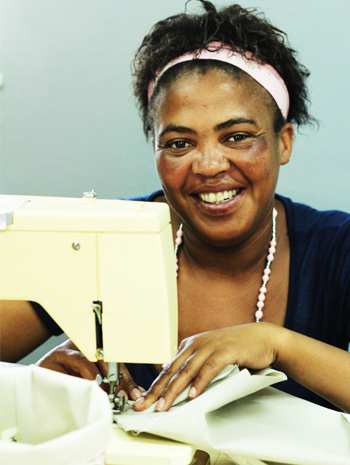 They moved to George with hopes of a better life but Sarel was unable to keep a steady job. Felicity started coming to Hope Church Wilderness Heights and was asked to join the Hope Art team. 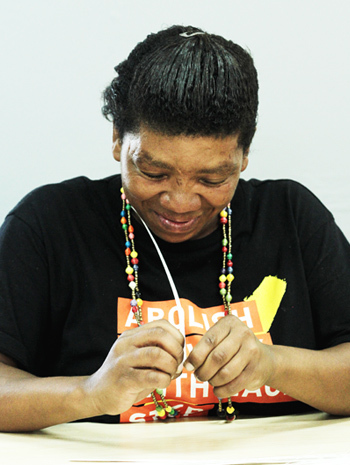 She is now able to support her family and give her children a better future. 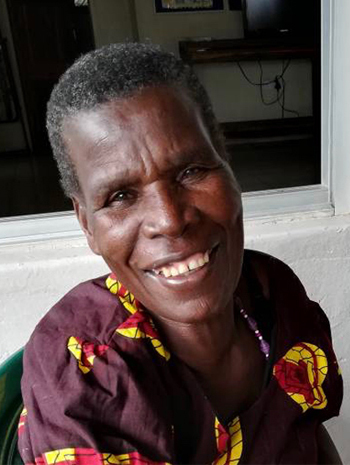 Doreen moved to Mongu in January 2019 to look after her sick father after her mother passed away. 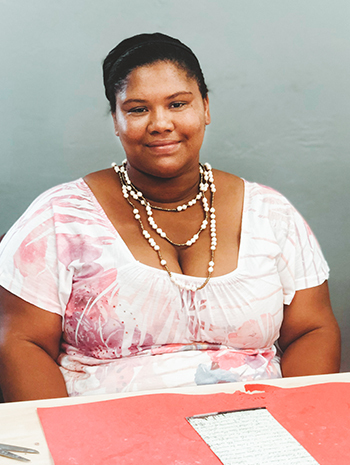 She joined Hope Church in January and instantly found a family. 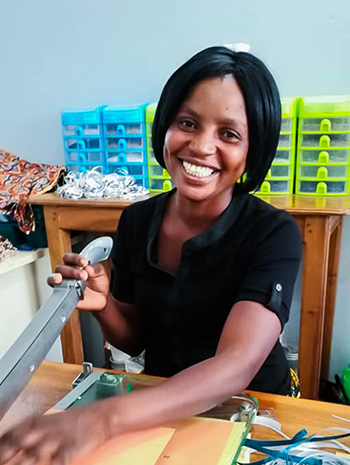 She was desperate to find work so she could support her sick father, 4 children, and her two younger sisters who had to stop school because there was no money. 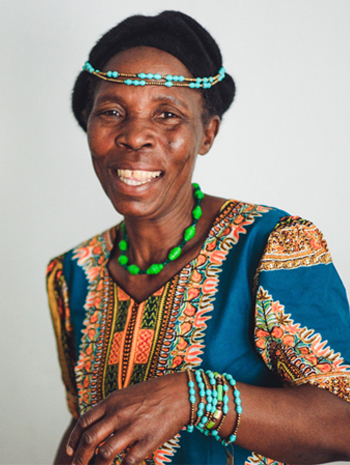 Doreen is so thankful for the opportunity to work with the Hope Art ladies, and we know her and her family now have brighter futures. My name is Elmarie Oktober, I was born on a farm close to Wilderness. My mom was not able to take care of me and so my grandparents took me in. I ran away from home back to Wildness to stay with other relatives. I was later placed in foster care. After matric, I decided to work and got into drinking and smoking. Last year I realized this is not how I want to live my life. I started coming to Hope Church and the Hope Art Africa team. I gave my heart to Jesus and last month I decided to get baptised. I love that here I can be myself. I love learning to sewing new things and seeing the final product. My name is Astie-Ann Solomons, I was born in 1992. My siblings and I were raised by our single mom. I do not have a relationship with my father. My mom worked hard to make sure were looked after and we went to school. I failed grade 12 and started working after. I have a 6-year-old boy. Since starting at Hope Art my life has changed. I gave my heart to Jesus and serve at Hope Church Wilderness. I wake up excited to come to work because our products are beautiful.